The first school in Locking was built in 1858 opposite the church. Known as the Parochial School, it was paid for by subsidies from the church, the Society of Merchant Venturers and ratepayers, and could cater for up to 50 children between the ages of 5-14. In 1861 the Schoolmistress was Miss Mary Jane Wilkins. Her job could not have been easy as attendance was not compulsory and resources were few, but she did have a house provided. The Old School building and house still stand today. In 1880 schooling became compulsory between the ages of 5-10, and the average attendance in 1889 was 20 children rising to 30 in 1897, possibly due to the leaving age being raised to 12. All the children were taught together in the same room and once a year they were tested on the ‘three R’s’ by an inspector. From 1903 until its closure on 30th march 1916 a Log Book gives us an insight into the activities of the school and the problems that arose; it makes interesting reading. 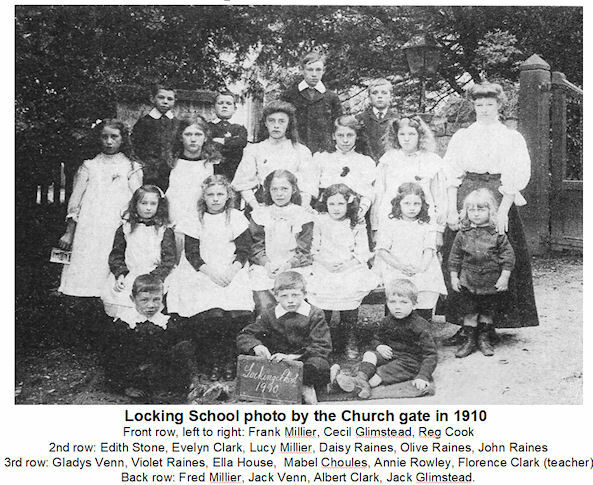 There is a photograph of the children taken in 1910 in front of the church with their teacher Florence Clark. The school was run by a small group of managers who included the Vicar, resident Curate-in-Charge, and the Misses Gimingham and Johnson from the Manor House, all of whom regular visits to see the children working and provide back-up for the Schoolmistress, who even then had problems with bad behaviour. There are entries concerning two boys in particular who were eventually expelled on 28th January 1905. Perhaps as a result of this the children were split into two groups, their lessons including singing, sewing and art as well as reading, maths and English. Miss Gimingham’s generosity extended to the schoolchildren with regular gifts of bags to keep their books in, money prizes, books, and bulbs in November and flower and vegetable seeds in spring. By 1916, possibly a direct result of the First World War, attendance had dropped to a level which made it no longer viable to stay open. From then until 1951 Locking’s children had to travel either to Hutton or Banwell for their schooling. Banwell seems to have been the preferred option, but once the RAF camp began to expand this influx became too much for its limited space. 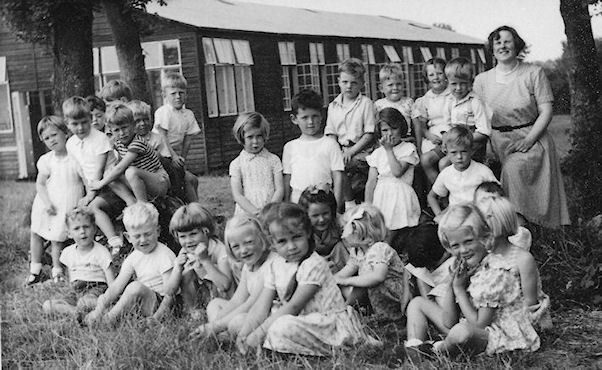 In 1951 two wooden huts on the RAF camp were used to accommodate schooling for the children from Locking. On 1st July 1952 with 49 children on the roll and Miss M.L. Creighton as Headmistress, this school in the huts on the camp officially became Locking School for children of the families on the RAF camp and children from the village. The children from the village crossed over the road to go to school on the camp. By 1958 the number of children had risen to 146 – a sign of the general growth of both the camp and the village around this time. On September 6th 1965 Mr Hobson took charge of the expanding school. With 210 on the roll it became obvious that the facilities provided by the wooden huts were inadequate, and a new school was built in the village on fields formally part of Manor Farm. The new school named ‘Locking County Primary School’ opened its doors for pupils on 28th March 1966. The official opening ceremony on 3rd May 1966 at 2.30pm was led by Air Marshall Sir David Lee. Dignitaries on stage included Mrs Miller-Barstow, (Chair of Education Committee), Sir David Slessor, Mr Deacon, (Chief Education Officer), Air Commander and Mrs Betts, (Station Commander), and Col. And Mrs Grey, (Chair, Axbridge Rural District Council), besides the school Managers and teachers. The speeches were followed by an historical pageant given by the children and the school was open to visitors for inspection. 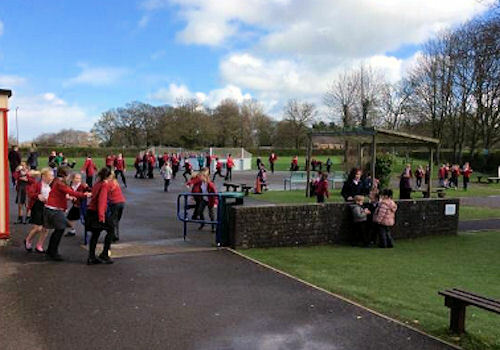 As numbers continued to grow more space was needed, and on 19th June 1969 work began on building a new infant school within the grounds which opened in 1972. Since then Locking school, despite fluctuating numbers and political and educational changes, has continued to provide a sound educational base for children from Locking village, the housing on the now former RAF camp and from the local area. Today the school has approximately 398 pupils and Headteacher is Mrs Joanne Jones. In 2018 it became an Academy as part of the Extend Learning Academy Network. 8 Local Primary Schools benefit from working together to enhance and enrich the education of all the pupils. 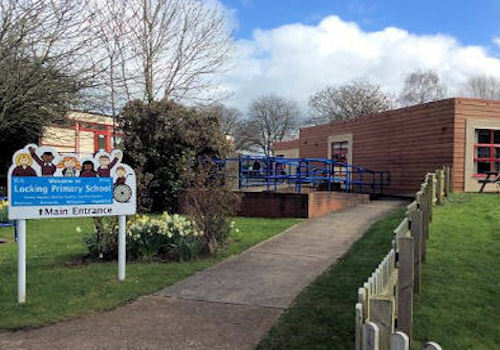 Locking is a popular school with children coming from all parts of the surrounding area. 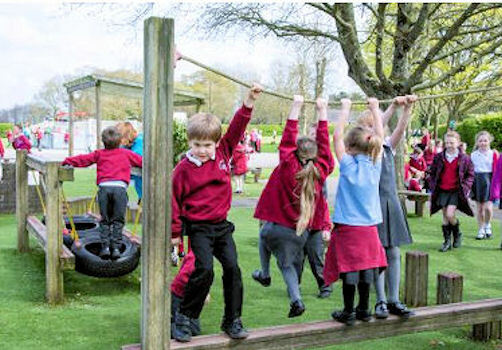 It is a community where the education of the whole child is developed in a caring organised and happy environment. Pupils enjoy, 'Working Together, Playing Together and Learning Together'. 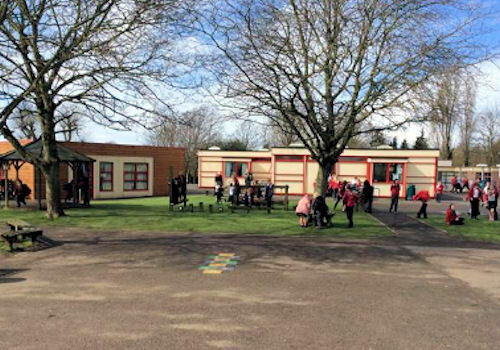 With the growth of the new housing estates, a new Haywood Village school has been opened on the former airfield site and a permanent new school on Locking Parklands is promised for the future on the former RAF Locking site.